An emotional plea for Jews to no longer require armed guards at the gates of synagogues and Jewish schools was the topic of discussion at the Central Blue Mountains Rotary Club in the Blue Mountains town of Wentworth Falls. 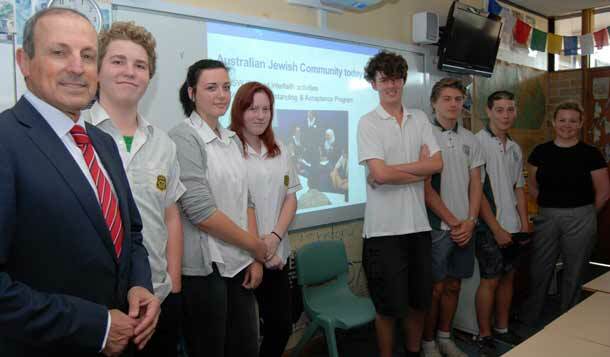 The appeal comprised the centrepiece of a moving vote of thanks for a presentation on “The Jewish experience in Australia” by NSW Jewish Board of Deputies CEO Vic Alhadeff. The event was part of a comprehensive bridge-building tour of NSW’s Blue Mountains undertaken by Alhadeff, NSW Board of Deputies Education chair Marilyn Immerman and Education manager Suzanne Green. Bridge-building tours are conducted annually to different areas of regional New South Wales by the Board of Deputies, recent venues including Broken Hill, Coonabarabran, Byron Bay, Mudgee, Albury-Wodonga, Taree, Armidale and Wagga Wagga. Last week’s visit included wide-ranging discussions with the Uniting, Anglican and Baptist churches in a number of Blue Mountains locations; presentations to schools on the Holocaust and Judaism; radio and newspaper interviews; presentations to Rotary Clubs; and a meeting with Shalom Aleichem Jewish community leader David Berger and a small group of members. The Board of Deputies emissaries encountered a number of people with connections to Israel or who had Jewish ancestry during the course of their meetings. “These tours are a vital aspect of our work,” Alhadeff said. “The rationale is to connect with other Australians throughout the state, engendering understanding of what Jews are about – our culture, our practices and our history, including of course Israel and the Holocaust.